This, the first novel ever written by Boyle, is an artifact in more ways than one. Completed in France between 1924–25, it was only recently discovered in an archive at the New York Public Library and is here published for the first time. It is a classic roman à clef, describing in almost photographic detail the sexual and artistic awakening of the author. The heroine, Kerrith Day, is a young woman living discontentedly in Cincinnati, where she works at her father’s business and dreams of escaping into a larger world of art and politics. Kerrith’s father, Harry Day, is a conservative businessman whose inability to make a success of his ventures have brought his family down several rungs on the social ladder, from comfortable bourgeois affluence to an apartment over a garage where they live with their Persian carpets and other reminders of happier days. Needing to break away, and encouraged by her freethinking mother, Kerrith leaves home—first to take a job as a stenographer (so as to earn the money to move to New York), and later to marry the French expatriate Soupault. 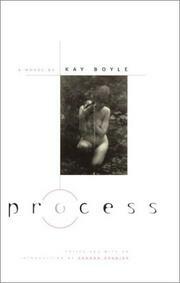 About as interesting in its own right as most novels by 22-year-olds, but, still, Process has a nice period feel to it and gives a good portrait of Boyle as a young artist.